At Fox World Travel, we know how important this communication is before, during and after a trip. That’s why we offer a variety of business travel communication tools we can customize to fit the specific needs of your business travel program. Whether you are communicating with one traveler or thousands, our tools will help you do your job more efficiently. These tools assist the travel manager in providing information to and keeping in touch with travelers during every step of the travel experience. MyFoxWorld 3i – Our mobile app makes information accessible by the touch of a finger on the day of travel. The app can house everything from itinerary information to destination maps. It can even send push notification alerts about airline delays and cancellations, as well as 24-hour check-in reminders. Fox Invoice 3i – A completely redesigned and highly customizable itinerary to interact and communicate with travelers. Fox Waivers 3i – Informing travelers when opportunities are available to adjust scheduled flights and avoid airline change fees through the use of advanced airline waiver technology. Fox Portal 3i – Our traveler portal offers individual user-authentication for a personalized travel dashboard, communicating important trip and company information. Fox World Travel’s pre-trip communication tools give you the ability to communicate regarding travel policy before the traveler begins his or her journey. Pre-trip approvals: Fox World Travel provides policy management for companies to ensure their travelers are making the best choices at the time of booking. So, for example, if the cost of a hotel reservation needs a pre-approval, we will seek that approval. This automated process makes it easy for travel managers and travelers to know if and when the business travel is approved. Compliance messaging: This message reminds travelers of correct travel choices based on company policy when certain pre-determined choices exist. Perhaps one of the most difficult communication challenges is tracking down travelers while they are on the road. It can be especially stressful when messages are urgent, like when a travel itinerary must change, or security may be compromised. Fox World Travel gives you peace of mind by providing ways to communicate no matter where your traveler is in the world. Know the real-time status of travelers: It’s difficult for travel managers to know the real-time status of travelers. Fox World Travel offers travel managers a tool that provides a visual overview of travel activity, country-specific risk levels and the option to initiate two-way communication with travelers. These messages—through text or email—can be generated quickly and may be targeted to multiple travelers at a time. Traveler alerts: Fox World Travel identifies weather or security issues worldwide and shares information with travel managers. The technology can be customized to send only to travelers who will be impacted. Whether you are new to Fox World Travel’s tools and offerings, or you or your traveler needs a refresher, we have a variety of training options available to you. When first implementing a business travel program, Fox World Travel conducts hands-on training of our online booking solutions, as well as how all of our tools benefit travel managers and travelers. Two live training sessions per month on our online booking tools. Small training sessions on specific facets of our booking tools. Travel managers have the opportunity to watch a live demonstration twice a month or a recorded webinar at anytime. A library of on-demand training resources and videos. 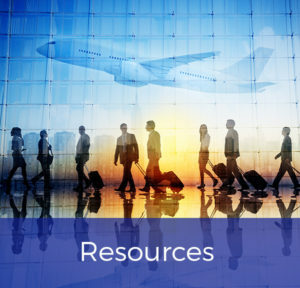 Fox World Travel has a library of training aids and guides on various topics to help you and your traveler begin a travel management program with ease. The next time your find yourself wondering how to better communicate with your travelers, give us a call at 920.236.8000 or 888.369.8785 or contact us online. We have the business travel communication tools that will put you and your business travelers at ease.